The Hats Off to Halloween tree that took the high bid of $16,000 in the American Needlepoint Guild’s 2004 Seminar Auction is now the subject of a stitch guide published by Mt. Tam Canvas Workers (MCTW), the Marin County chapter whose members designed and stitched the three-dimensional hats. Needlepoint Inc. Finishing of San Francisco finished the stitched canvases that were displayed on a Radko ceramic Halloween tree. 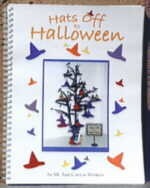 The 75-page book, with 27 color pages, includes a photo of each hat, directions and stitch graphs, a materials list, templates for the 25 hats (8 more than the original tree), and a complete stitch guide for the Hats Off to Halloween sign. It is spiral bound for ease in working directly from the stitch guide. The Hats Off to Halloween ANG Auction project was facilitated by Jan Morgan of Corte Madera, President of MTCW from 2002 to 2004, and Linda Kilgore of Tiburon, President of MTCW from 2004 to 2007. The designer-stitchers featured in the book are: Zora Apt (San Rafael), Linda Botts-Brennan (Petaluma), Sandi Deckinger (San Francisco), Linda Kilgore (Tiburon), Toni Montrone (Corte Madera), Jan Morgan (Corte Madera), Denise Raney (Santa Rosa), Louise Rapoport (Novato), Janet Swing (Novato), Gauri Tandavan (Larkspur), Fran Thorsson (Novato), Cindy Van Buren (Windsor), and Helen Voronin (Petaluma). Ratna Tandavan donated her graphic design services. To order copies of the Hats Off to Halloween stitch guide, send a check or money order payable to Mt. Tam Canvas Workers in the amount of $39.95 and $4.75 shipping, for a total of $44.70 to Hats Off to Halloween, c/o Joanne Alkazin, P. O. Box 150985, San Rafael, CA 94915-0985. California residents add 8% sales tax ($3.20 per book). For multiple copies to the same address, add $1.25 shipping for each additional copy. An order form is available for your convenience. If you have question, please contact us.